Enjoy a leisurely lunch with friends and neighbors while supporting our local restaurants. Come prepared for good food, good friends & fun conversation! Powerful inspiration for the soul ……… and yummy lox & bagels too! Psalms lecture given by Rabbi Yaacov Orimland. Men & Women Welcome! Brunch to begin working on a Kugel Recipe book fundraiser for our local organizations. A cocktail reception celebrating the Legacy Teams to have met or surpassed their goals. 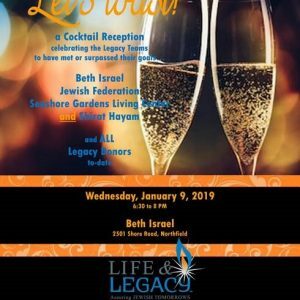 Beth Israel, Jewish Federation, Seashore Gardens Living Center and Shirat Hayam and all Legacy Donors to date. Guests will bring a dinner item to one course and a check to Hadassah for $25.00. There are 3 houses to visit for a wonderful evening. Join us for a relaxing evening of fun, friends, munchies and mosaics. Clay Station on the Go will guide you through crafting your own unique mosaic creation. Perfect for gift giving!